"Abiding Under The Shadow: God's Call To Return To Covenant Relationship For His People"
A prophetic word to the world-wide church... to all who will hear! See the revelation of Psalm 91 open up to you as never before! Do you abide under the shadow of the Almighty? What does it mean to be in covenant with God, and what are the benefits? These questions and more will be answered if you will take this exciting journey through 12 levels of discovery! Deep calls unto deep. God is calling His church to come deeper in their relationship with Him. Will you come to the depths where a vast ocean of all that God is awaits you? You will be challenged, perhaps like never before. Discover some mysteries and secrets that have been kept hidden until now. God is revealing them through His prophets in this day! 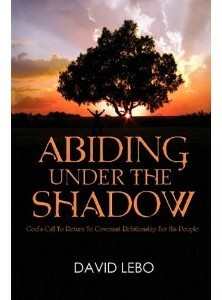 A must read for all believers and ministers! Sandy-- Mass. -- "Dave, it's hard for me to even put into words what your book has done for me deep within! God's planning and timing is awesome. I'll try to explain briefly, at the same time I ordered your book our Church was going through some awesome stuff spiritually and physically, God has been calling us to Him, His presence was increasing and then the sprinkler system went off in our church for no reason.. Water damage from top to basement, our Pastor knew this was all Prophetic, God was changing our church physically and spiritually. He gave us a surprise, especially one Sunday. His presence was so strong Pastor had a hard time standing, I went to give a word and 3 people had to hold me up. That went on for several weeks...All that to say we knew God was asking to come back to Him in deeper way, knowing this and reading your book has allowed God to grip my heart like never before. God has always taught me with books and that is why I knew this was all a divine setup. I just finished your book at 2 am this morning.